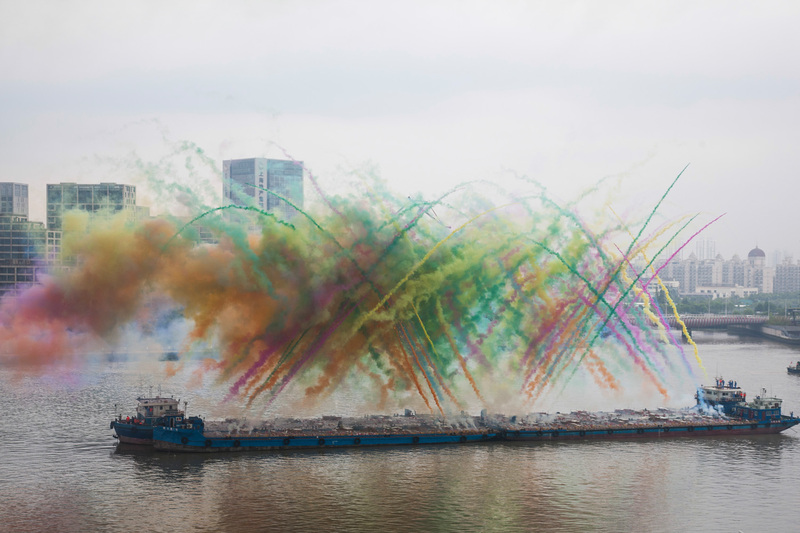 On August 8, the opening day of the exhibition, Elegy: Explosion Event for the Opening of Cai Guo-Qiang: The Ninth Wave took place at 5 pm on the Huangpu River by the museum. 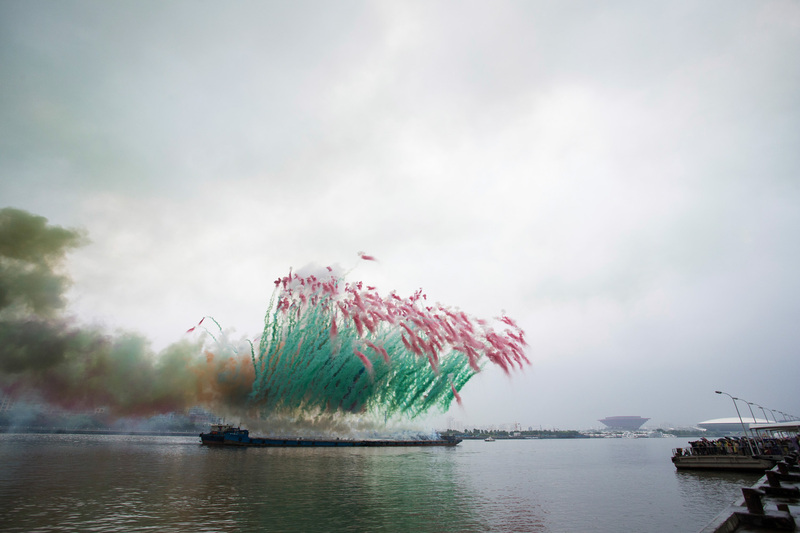 The work was the first public large‐scale daytime ‘explosion event’ the artist realized in Mainland China. Conceived in three chapters—Elegy, Remembrance and Consolation—the ceremonial ‘explosion event’ projects an image of nature in decline. The first part, Elegy, opened with dramatic black and white smoke mines and cascade effects. Reminiscent of a funerary parade, black smoke “crows” with flapping wings represent the joys and sorrows in life. The scene then ended with green smoke, or “grass and weeds,” resembling an exhale, or a mournful sigh. 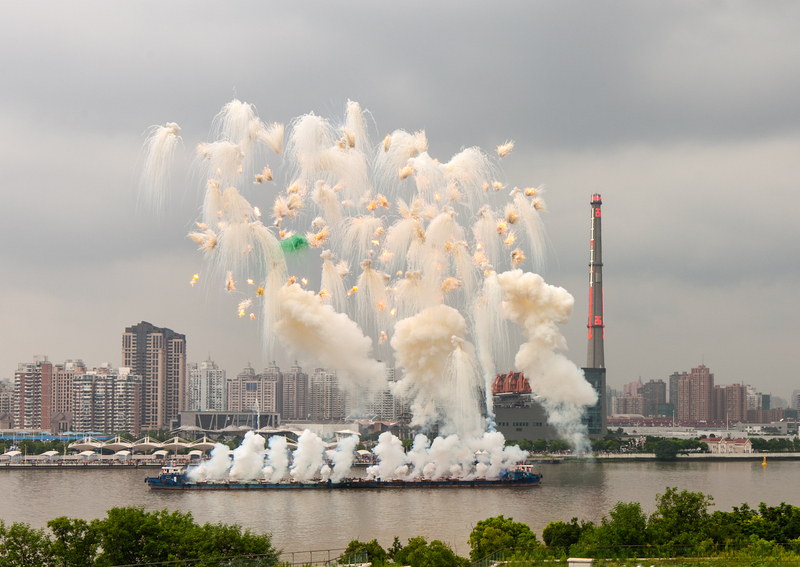 Remembrance, chapter two of Elegy: Explosion Event for the Opening of Cai Guo-Qiang: The Ninth Wave, realized on the riverfront of the Power Station of Art, 5:00 p.m., approximately 8 minutes. In Remembrance, colored smoke effects splashed across the sky, as though nostalgically recalling past events and friendships throughout the years. Consolation brought warmth to the living; short, powerful spurts of aerials shells formed colored and white chrysanthemums in the sky, gaining speed for the finale. Yellow willows filled the horizon slowly, drawing the explosion event to a close. In line with the theme of the exhibition, environmentally safe daytime colored smoke pyrotechnic products are used for the artwork; food coloring, food-grade powders, fabric dyes and other nontoxic materials are used as main ingredients. 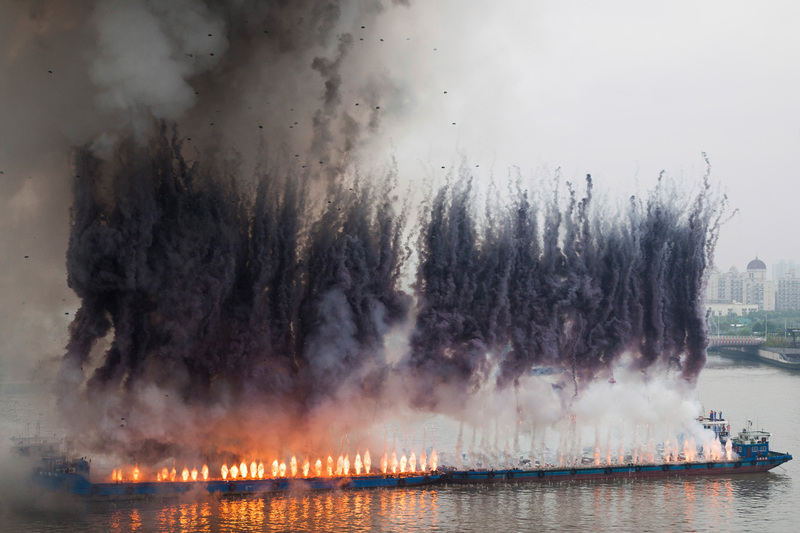 Cai Guo-Qiang: The Ninth Wave opened at the Power Station of Art, Shanghai on August 8, and will be open through October 26.